Jorge Bergoglio of Argentina was elected pope Wednesday, becoming the first pontiff from the Americas and the first from outside Europe in more than a millennium. He chose the name Francis, associating himself with the humble 13th-century Italian preacher who lived a life of poverty. Looking stunned, Francis shyly waved to the crowd of more than 100,000 people who packed a rain-soaked St. Peter's Square for the announcement, marveling that the cardinals needed to look to "the end of the earth" to find a bishop of Rome. Francis' installation Mass was slated for 4:30 a.m. ET on Tuesday, March 19, with Vice President Joe Biden, a Catholic, heading the U.S. delegation to it. For full coverage of Francis I's papacy, visit NBCNews.com. In choosing a 76-year-old pope, the cardinals clearly decided that they didn't need a vigorous, young pope who would reign for decades but rather a seasoned, popular and humble pastor who would draw followers to the faith and help rebuild a church stained by scandal. The cardinal electors overcame deep divisions about the future of the church to select the 266th pontiff in a remarkably fast, five-ballot conclave. Francis asked for prayers for himself, and for retired Pope Benedict XVI, whose stunning resignation paved the way for the conclave that brought the first Jesuit to the papacy. Francis also spoke by phone with Benedict after his election and plans to see him in the coming days, the Vatican said. "Brothers and sisters, good evening," Francis said to wild cheers in his first public remarks as pontiff from the loggia of St. Peter's Basilica. "You know that the work of the conclave is to give a bishop to Rome. It seems as if my brother cardinals went to find him from the end of the earth, but here we are. Thank you for the welcome," he said. Across the planet, Latin Americans burst into tears and jubilation at news that the region, which counts 40 percent of the world's Catholics, finally had a pope to call its own. "It's a huge gift for all of Latin America. We waited 20 centuries. It was worth the wait," said Jose Antonio Cruz, a Franciscan friar at the St. Francis of Assisi church in the colonial Old San Juan district in Puerto Rico. Bergoglio had reportedly finished second in the 2005 conclave that produced Benedict — who last month became the first pope to resign in 600 years. The speed with which he was elected pope this time around indicates that — even though he is 76 and has slowed down from the effects of having a lung removed as a teenager — he still had the trust of cardinals to do the job. 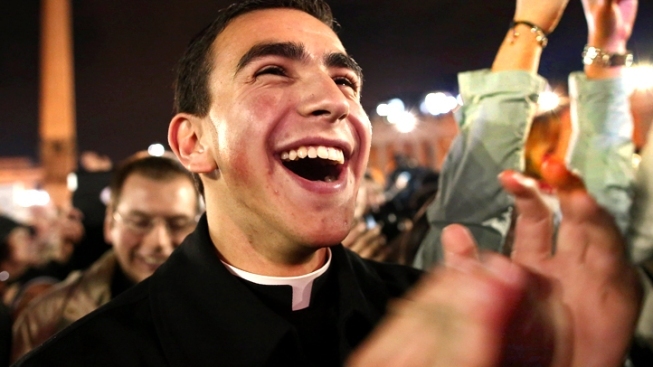 After announcing "Habemus Papam" — "We have a pope!" — a cardinal standing on the balcony of St. Peter's Basilica on Wednesday revealed the identity of the new pontiff, using his Latin name, and announced he would be called Francis. The longtime archbishop of Buenos Aires is the son of middle-class Italian immigrants and is known as a humble man who denied himself the luxuries that previous Buenos Aires cardinals enjoyed. He often rode the bus to work, cooked his own meals and regularly visited the slums that ring Argentina's capital. He considers social outreach, rather than doctrinal battles, to be the essential business of the church. Bergoglio, who as a teen lost a lung to infection, showed that humility on Wednesday, saying that before he blessed the crowd he wanted their prayers for him and then he bowed his head amid the silence from the crowd. In choosing to call himself Francis, the new pope was associating himself with the much-loved Italian saint from Assisi associated with peace, poverty and simplicity. St. Francis was born to a wealthy family but later renounced his wealth and founded the Franciscan order of friars; he wandered about the countryside preaching to the people in very simple language. St. Francis Xavier is another important namesake. One of the 16th century founders of the Jesuit order, Francis Xavier was a legendary missionary who spread the faith as far as India and Japan — giving the new pope's name selection possibly further symbolic resonance in an age when the church is struggling to maintain its numbers. Francis will celebrate his first Mass as pope in the Sistine Chapel on Thursday, and will be installed officially as pope on Tuesday, according to the Vatican spokesman the Rev. Federico Lombardi. In an interesting twist the Jesuits were expelled from all of the Americas in the mid-18th century. Now, a Latin American Jesuit has been elected head of the 1.2-billion strong Catholic Church. Tens of thousands of people who braved cold rain to watch the smokestack atop the Sistine Chapel jumped in joy when white smoke poured out a few minutes past 7 p.m., many shouting "Habemus Papam!" or "We have a pope!" — as the bells of St. Peter's Basilica and churches across Rome pealed. After what seemed like an unending wait of more than an hour, they cheered again when the doors to the loggia opened. The cheers became deafening when Bergoglio's name was announced. Elected on the fifth ballot, Francis was chosen in one of the fastest conclaves in years, remarkable given there was no clear front-runner going into the vote and that the church had been in turmoil following the upheaval unleashed by Benedict's surprise resignation. For comparison's sake, Benedict was elected on the fourth ballot in 2005 — but he was the clear front-runner going into the vote. Pope John Paul II was elected on the eighth ballot in 1978 to become the first non-Italian pope in 455 years. Bergoglio's legacy as cardinal includes his efforts to repair the reputation of a church that lost many followers by failing to openly challenge Argentina's murderous 1976-83 dictatorship. His own record as the head of the Jesuit order in Argentina at the time has been tarnished as well. Bergoglio also was accused of turning his back on a family that lost five relatives to state terror, including a young woman who was 5-months' pregnant before she was kidnapped and eventually killed in 1977. The woman's child, who survived, was given to an "important" family. Despite written evidence indicating he knew the child had been given away, Bergoglio testified in 2010 that he didn't know about any stolen babies until well after the dictatorship was over. 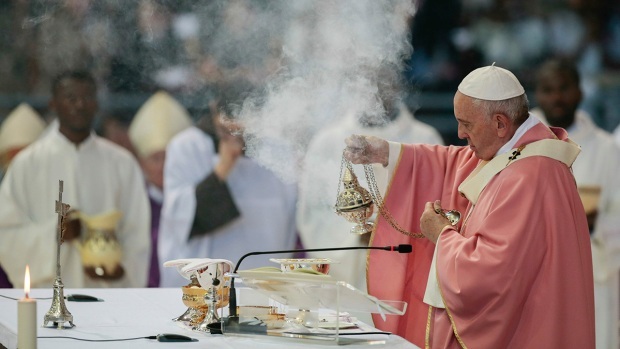 Unlike the confusion that reigned during the 2005 conclave, the smoke this time around has been clear: black during the first two rounds of burned ballots, and then a clear white on Wednesday night — thanks to special smoke flares akin to those used in soccer matches or protests that were lit in the chapel ovens. Despite the great plumes of smoke that poured out of the chimney, Lombardi said, neither the Sistine frescoes nor the cardinals inside the chapel suffered any smoke damage.